Goldie looking for some worms. 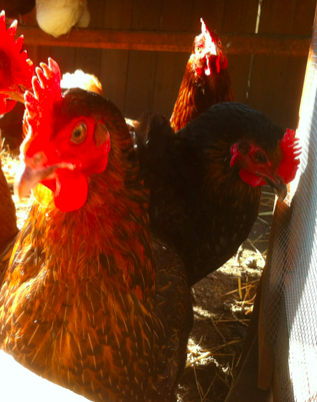 One of the highlights for people when they come over to our home is that we have chickens. Many people don’t believe that chickens are legal in the City of Chicago. Yes, they are legal in Chicago, but are not legal in all cities. Not only are chickens great pets, they provide a lot of services for us and add to our slow dwelling. Our daughters have named them, but I can’t really tell who is who, outside of a few of the obvious names like Snowie and Whitie (taken from Snow White) for the two white ones and Penny and Goldie for the two golden ones. I don’t know what breeds we have, but they are all great birds. My only regret is that we only have one color of egg and that is traditional brown. We live near our girls school and it is such a pleasure when we have classes over from the school. We had our Kindergartener’s class over one day and they got to hold the chickens. It was awesome seeing some of these kids who had never held a chicken before be nervous at first, only to ask to hold them again and again. Just last Monday, we had two 6th grade classes over and many of them had never held or seen a chicken up close. It was fun to see them excitedly participate. We put the chickens to work around our home. We have them eat bugs that we don’t want hanging around the yard, we have them poop so we can use it as part of our compost for our nutrients, they scratch around the yard and they make eggs. Each chicken lays an egg every 24 to 30 hours or so. Since we have 9 chickens that would mean that we would get between 7 and 9 eggs every day. We obviously don’t eat that many eggs in our family, so we partnered up with 3 other families on the block, which works really well. Chickens are not a lot of work, but they do need tending every day. Someone needs to let them out in the morning, check their food and water and put them away at night. So it is a twice a day activity, even though it only takes 3 or 4 minutes each time. Each of the other families has a night of the week (Monday, Wednesday and Thursday) that they come by, close them into the coop, make sure they have food and water and grab the eggs. They also contribute a bit for the feed. But having 3 other families involved makes it easy for when we go out of town for the weekend or need someone to pick up an extra night. Plus, it is about creating community with our neighbors. We now interact much more them then we would otherwise would and it makes it nice to continue to build our local community. As Julie cooks and bakes more, it is great to know that one of the ingredients (eggs) is coming from our back yard. We get the chicken feed from elsewhere and we know we will have to continue to reduce our dependence on that, but for now, it’s fun. It’s great having more animals in the yard and that the girls are exposed to. Owning chickens continues to add to the slow dwelling. I am an entrepreneur now turned aspiring eco-entrepreneur. I have always had a green tint to myself, recycling and trying not to be wasteful. With the birth of my oldest daughter, I started to wonder what the world would be like when she got older. As I started to educate myself about what is happening to the basic systems we depend on for life and that we have evolved over the past 100,000 years to survive as a species, I became very concerned about the standard of living my kids would have if we continued on this trajectory. The more I became educated, the more I realized the size of the challenge in front of us and the more drawn I became into trying to figure out a way I could help our planet move in a sustainable direction. I think about resilience (local, durable, equatable, distributed, sustainable,...) as the guiding framework for a better future. This entry was posted in Community, Food Production, The Chicks. Bookmark the permalink.